Well most of us had those whitish looking spots in our nails atleast once in a life time. Some of us probably had it many times. Well people those whitish looking spots are medically termed as 'leukoonchynia' . But don't worry this term just means white nails in latin. . So , its harmless. But how did it happen? Why did it happen ? the question that comes in our mind first when we see those white spots in our nails. But hey wait there's no need to panic . Today I will tell you some of the causes of those spots occuring in nails and easy home remedies. The major cause of these whitish spot is deficiency of different minerals like calcium , zinc , etc. what happens is our body needs these minerals to form the nail but when there is lack of those minerals then there appears those spots in the nail bed . And as the nail grows it reaches the front part of nails . But this doesn't mean that you need to take any mineral supplements . Just include calcium and zinc rich foods in your diet like milk products , fishes , nuts , meats , fruits . Another cause can be due to trauma to the nails . Whenever you slam a door then sometimes the nails are squeezed in between the door. I agree that Its a painful process but it is also major cause. 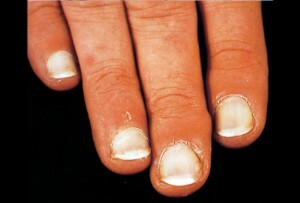 Some may have noticed after you come from gym or some other works you see that whitish spot appearing in the nails. So, no need to worry about this . Just give it a time to heal and if its really damaged then I suggest you to see a doctor. Sometimes you see the whitening of the whole nails . This condition occurs when there is hypoalbuminia . Well, its a kind of protein deficiency . It can occur during kidney diseases, liver diseases , protein malabsorption . So at such case , I suggest you to visit a doctor .